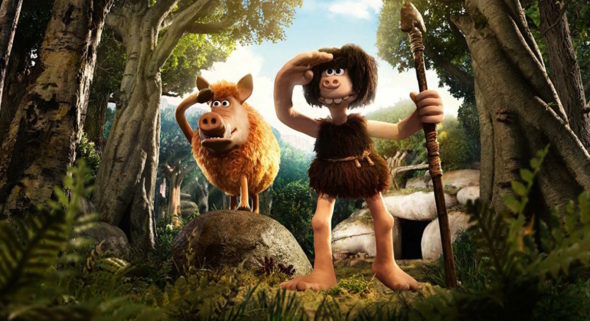 There is something adorably British about Nick Parks’s latest plasticine adventure, Early Man. No I am not being condescending. It’s animated. It’s supposed to be adorable. This Aardman export—the Brit animation studio responsible for the Wallace & Gromit classics, among others—pits dunder-headed but lovable cave dwellers against greedy Bronze Age Euro-trash as it spoofs sports flicks. We open at the dawn of time, when dinosaurs and cave men and giant, toothy mallards roamed the earth outside Manchester, England. Around lunchtime. It’s silly. And sweet. And basically a 90-minute mash note to Manchester United. When those posh bullies from the Bronze Age (led by Tom Hiddleston’s Lord Nooth) push Dug (Eddie Redmayne) and his nincompoopy cavemen friends out of their fertile valley, Dug devises a challenge to regain his beloved home. Like all great sports films, Early Man pushes the underdog narrative to epitomize more than simple foot-to-ball competition. Plus, you really do want these earnest faces, overbites and all, to learn to believe in themselves. And why can’t a pig play soccer? Dug’s quick trip into town square offers opportunities for the Aardman Easter eggs—be sure to scan the vendor booths for hilarious names. With voice talent to spare (Timothy Spall and Rob Brydon are among those with smaller roles), you’re assured the intentionally silly jokes are delivered expertly. The problem is that Early Man would have made for a really hilarious short. The story doesn’t benefit from a 90-minute stretch. The setting—mainly an imposing landscape littered with enormous rib bones—doesn’t offer enough opportunity for visual distraction and the characters are not memorable enough to keep your attention for the full run time. Expect much of the familiar: googly eyes, enormous teeth, simple characters and kind-hearted laughter. CGI mixes with the stop-action to rob the film of some character, but Early Man has charm to spare.